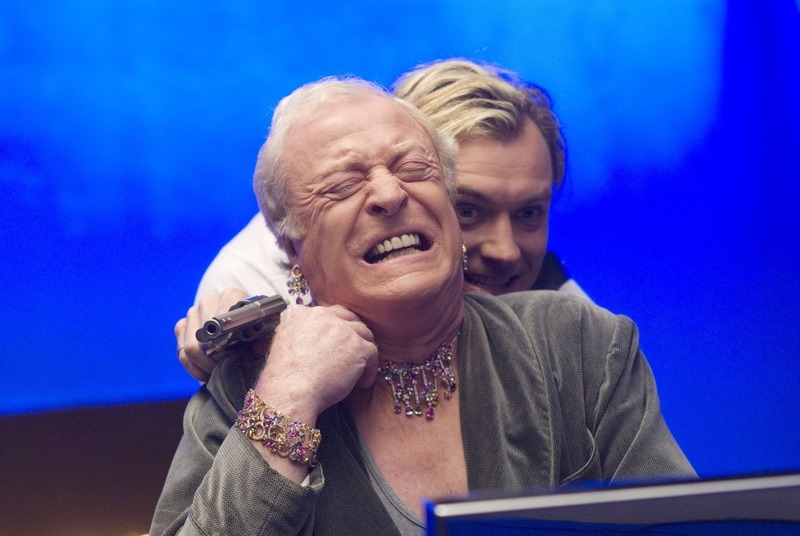 The 2007 remake of Sleuth is one of the most unique moments in cinema. Remakes are a dime a dozen in Hollywood, but it isn't often that the star of the original is allowed to play the rival to the character he played in the remake. 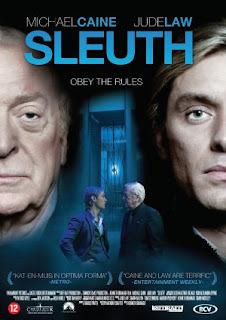 However, this was the situation with Sleuth, where Michael Caine becomes one of the few actors to play both characters of a two character piece in two film versions of the same story. It's unfortunate that despite being a great actor, and despite having an equal in Jude Law, a brilliant director in Kenneth Branagh, and a brilliant writer in Harold Pinter, the end result could be so dull, idiotic, and a sheer waste of everyone's time and talents. Sometimes, too much breeding is a bad thing. Wealthy author Andrew Wyke (Caine) has invited Milo Tindle (Law) to his home. Both know that Milo is Andrew's wife's lover. Andrew tells Milo he has no real problem with Milo taking Maggie, but Maggie will eventually leave her chauffer/actor lover and return to Andrew. This is something Andrew does not want. Convincing Milo to steal insured jewels and then sell them to a fence, which would keep both of them to the life Maggie has grown accustomed to. However, this is all part of an elaborate ruse to torment, perhaps kill Milo. Next, an Inspector Black comes to investigate Milo's disappearance. Soon, it becomes clear that Black is Milo (painfully so, I might add), and Sleuth ends with one dead and one about to be discovered as a murderer. We both are better than this. I saw the original Sleuth and I don't compare the original to the remake per policy, opting to offer my views on another posting. However, one can only hope that people don't get discouraged to check out the original if they make the mistake of encountering the remake. Sleuth is despite the short running time (about less than an hour and a half) shockingly slow, boring, and even weird. So many bizarre decisions in terms of story and direction make Sleuth at times incomprehensive, confused, and self-indulgent. The first is Branagh's decision to focus so much on the high-tech visuals. The film is dominated by shots of the surveillance cameras that become far too distracting. At one point, we hear Law and Caine carrying on dialogue but their heads are cut off. Another odd choice was to constantly cut shots within the same scene. There are scenes that jump all over the place, and given that Sleuth is a two-man piece there should be no reason why they can't share the screen. The screenplay similarly takes odd turns that plot-wise don't make any sense. Near the end of the film, there is a strong suggestion of homoeroticism that was nowhere to be found up till then. There was no reason to introduce this element into the story, and it smacks of desperation. The art direction and cinematography only served to emphasized the unreality of the situation. Everything highlights the odd circumstances of Sleuth, and unfortunately draw attention only to themselves, a fatal decision in a mystery. Finally, both Law and Caine looked like they were trying too hard to make the material work. The former acted as if he were hysterical, the latter as if he were cashing a check. I will definitely not be watching this piece of junk, however I am slightly interested in the original. The original is much better. Granted it starts out slow and a bit talky, but once it gets going it takes one wild (and logical) twist after another that holds your attention. Also, it is wonderful to see two great actors (Olivier and Caine) give great performances (both Oscar-nominated, losing to Brando in The Godfather).